Teams of students will practice spelling words to move members through the obstacle course to score points. 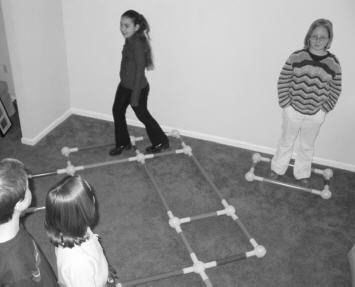 Create an obstacle course using the Toobeez (you can determine its shape). Place the chart paper, chalkboard or dry- erase board at the end of the course so students can mark their points. Challenge: Teams of students will practice spelling words to move members through the obstacle course to score points. 2. Divide students into two teams. Explain the game to the teams. Line up the two teams parallel to one another. At the start of each word, one team member (Student 1) will stand at the start of the obstacle course and another member (Student 2) will enter the Spelling Square. Student 2 is given a word to spell. No other members can help Student 2 spell the word. If spelled correctly, Student 1 may enter the course and travel all the way through to score the team’s point. If a mistake is made, determine how many letters were correct before the mistake. That is how many “spaces” Student 1 should move through the course. Now, the other team may attempt to steal the misspelled word. If they spell it correctly, they win the point and the student in the course can go back to his or her line. If the opposing team makes a mistake, determine how many letters were correct before the mistake. Student 1 (still in the course) will move forward one “space” for every TWO letters correct before the mistake. If this leads the student out of the course, that student’s team wins the point. If it does not, no one wins a point, but the next team’s turn starts from where Student 1 left off in the course. **See below an example of how this is played! course to mark a point. Team B is given the word “meticulous.” Chris (now in the Spelling Square) spells the word as: m-e-t-i-c-o-u-l-o-u-s Since the first five letters were spelled correctly before he made a mistake, Kristen can move five sections into the course. Now, Team A is given a chance to steal the same word. Josh spells the word: m-e-t-i-c-u-l-u-s. Since seven letters are correct, Kristen (who is still in the course) will move ahead one space for every TWO letters correct (in this case, only three spaces – no rounding up). If this gets Kristen to the end of the course, Team B wins the point. If it does not, no one wins a point, but Andrew replaces Kristen at her spot as the starting point for his team’s next word. 3. Play the game until a certain point value is won or a set time is over. 4. After the activity, move to the “Activity Discussion and Processing” section of the activity. 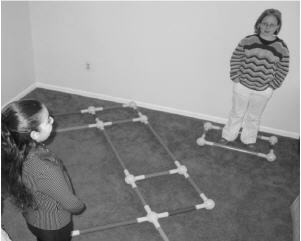 Above, a student (at right) in the Spelling Square attempts to spell a word so her teammate (left) can move into the obstacle course. 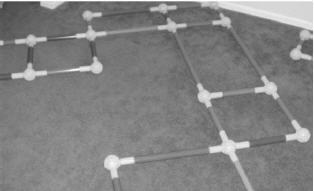 This is a sample of how a simple obstacle course could look. How did this game motivate you to focus on your spelling? How did your group work together for a common goal? Why is it important for citizens to work together? 1. Remove the element of competition. Play the game in the same manner and track points. At the end of the game, however, combine point scores for a total score. After students study their words, play the game again (perhaps the next day or as a review for a test) and see if they can beat their original combined score.